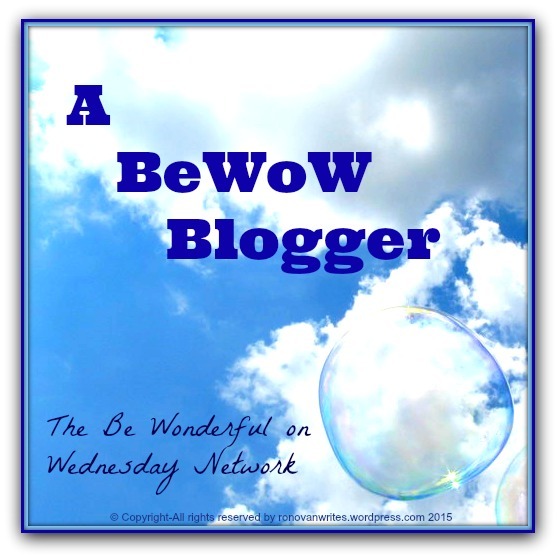 Home#BeWoW Blogshare Wednesday. Get those Positive posts ready. #BeWoW Blogshare Wednesday. Get those Positive posts ready. BeWoW stands for Be Wonderful on Wednesday. #BeWow is one word. But really you don’t have to wait for Wednesdays. The idea is to post something about Wonderful on Wednesdays, though. Each Wednesday a post will show up here on RonovanWrites about something Wonderful for me or maybe a #BeWoW Guest Blogger will show up. Post a link to your Wonderful post in the comments to share with everyone. That’s one way it works. Simple as that. The there is the Twitter way. Write a post and Tweet it with the hashtag of #BeWoW and to be 100% positive it does get ReTweeted by me you CAN add @RonovanWrites to your Tweet and I’ll RT it. Okay, I’ll RT it when I wake up. 🙂 And other bloggers will be RTing as well when they see it. Make sure it’s a post that is positive, encouraging, uplifting. I think you get the message here. This is not for just a post you want to share. It MUST have the #BeWoW message of Positivity. Create a post or choose one you have that meets the encouraging/positive/wonderful definition. Share that link from your blog in MY Wednesday #BeWoW post I put out after midnight Wednesday EST. That way others that drop by here can go check you out if they like. It’s not a requirement, just a way for others to see your post. When you share your post on Twitter use the hashtag #BeWoW, all one word, which I have registered and am the administrator of, on Wednesdays. We can all ReTweet what we see and like. You can include my twitter handle of @RonovanWrites in your Tweet and I will RT everything I see that is positive. Please don’t use this for anything but positive things. Probably Tweeting is the big part of this for some of you. You don’t HAVE to come to my post and comment, but if you would like to and get some people that don’t do Twitter, then go for it. If you don’t have Twitter, the original idea for this was for sharing amongst Blog World so drop in here and share. You can also go to our facebook page Be Wonderful on Wednesday where you can put a link to a post. A link to on that page will be Tweeted through my Twitter Handle @RonovanWrites. One thing to remember is when you post a link on the page if you include a hashtag, that hasthtag will carry over to Twitter. This is a great way to have your friends see posts that don’t have Twitter or don’t really visit blogs. Invite them to like the page. If you just can’t wait until Wednesday? Post and share later and just make sure to Tweet with the hashtag #BeWow and my handle if you remember and the RT will begin. This is the badge you can use if you like to put in your post and/or your sidebar. My side bar I found that 210×210 pixels is as large as it goes and shows everything. Why is there a copyright in the picture? My son “B” and I took the picture. He blew the Bubbles while I was on the ground looking up at the sky. He loved popping them and splashing me with the water. Hey, I thought it was a good idea at the time. At least he laughed. And that’s why I chose it as the Wonderful image. #BeWoW began as a simple Positivity post on a Wednesday. I wanted to do something that kept me focused on being just that, Positive. Things were suggested and here we are. A registered Hashtag, an official Twitter Handle @BeWowBlogShare There is actually a blog for it, but only as a way of holding the name for when this becomes huge. There is a facebook page, Be Wonderful on Wednesday where you can put a link to a post. A link to on that page will be Tweeted through my Twitter Handle @RonovanWrites. One thing to remember is when you post a link on the page if you include a hashtag, that hasthtag will carry over to Twitter. Invite your friends to like the page and they can see the links to the posts without Twitter. I do hope you join in and #BeWoW every day. And if you do like the idea, please feel free to share this post by reblogging, tweeting or sharing it wherever your blogging friends might see it. ← Share it, don’t wear it. Join Ronovan Writes and spread the power of positiveness through the world! I will see you there tomorrow!